Led by one of the state's best fronts, the St. John's defense is off to a great start in 2016. The St. John’s (Shrewsbury) Pioneers outlasted the Nashoba Chieftains, 12-0, in a gritty, rainy defensive battle in Bolton on Friday night. In a tight game where both offenses are struggling to find a rhythm, one big play can determine the outcome of the game. On Friday night, that big play belonged to St. John’s (3-1). With the game scoreless and time winding down in the third quarter, St. John’s quarterback Steven Bucciaglia scrambled, evaded a couple of Nashoba (2-2, 1-1 Mid Wach B) defenders with the help of his offensive line, and completed a 50-yard pass to senior wide receiver Khamal Saunders for the ice-breaking score with 1:22 remaining in the third quarter. “Fortunately, we were able to turn a broken play into a long score and get on the board,” St. John’s head coach John Andreoli said of his team’s fifty-yard touchdown pass. The first score of the game almost came much earlier in the contest. Nashoba defensive end Robert Ryan intercepted a Bucciaglia pass in the first quarter and returned it to the St. John’s 3-yard line. Just three plays later, however, Nashoba fumbled on third-and-goal from the one-yard line, and senior captain Flynn McGilvray pounced on the football for the Pioneers. On Nashoba’s next possession, the Chieftains fumbled the wet football once again, and senior captain Tom Feraco recovered the pigskin for St. John’s. On St. John’s ensuing drive, an 11-yard run by Michael Bernard and a 29-yard pass from Bucciaglia to Sanders set up St. John’s with first-and-goal on the Nashoba 5-yard line. Four runs up the middle by the Pioneers were stuffed by the Chieftain defensive line, and the Pioneers turned the ball over on downs. The two teams traded turnovers on downs and punts until Saunders’ touchdown reception. Both the Pioneers and the Chieftains forced four-and-outs on the next two drives. Nashoba received another scoring chance when the Pioneers elected to try a fake punt on fourth down from the St. John’s 20-yard line. 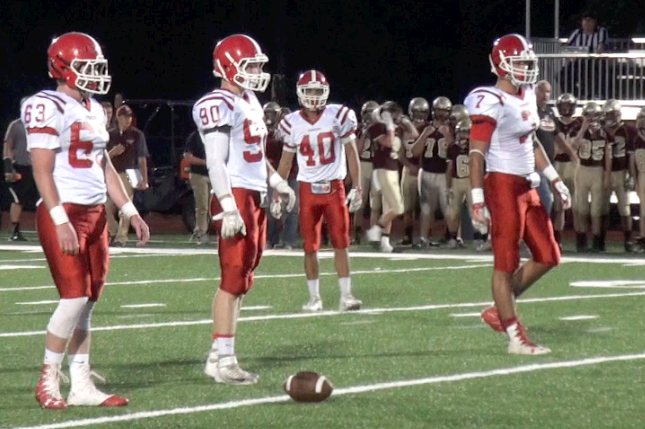 St. John’s defense responded to the challenge, forcing another Chieftain four-and-out. Coach Andreoli was pleased with how his defense executed the game plan. “Our defense has stepped it up all year…. We played a lot of base defense with zone coverage, and let our guys get comfortable with their reads. We got eleven guys to the football… We executed real well (on defense),” Coach Andreoli said. On St. John’s ensuing offensive possession, junior running back Peter Oliver broke through the Nashoba defensive line and sprinted past the Chieftain secondary en route to a 59-yard touchdown to clinch the game with 2:16 left in the fourth quarter. Coach Andreoli wants to see his team build off of the 3-1 record in September and continue to play well. Their first game in October is an intra-town showdown with Shrewsbury High School next Saturday at 1:00 PM. “We got to get ready for (the Colonials). It’s a cross-town rivalry, and you can pretty much throw records out the window whenever you play Shrewsbury,” Coach Andreoli said of his team’s next matchup. Nashoba will look to return to winning ways in their next contest against Fitchburg on Friday at 7:00 PM at Crocker Field in Fitchburg.